Shower enclosures are a Kudos speciality. 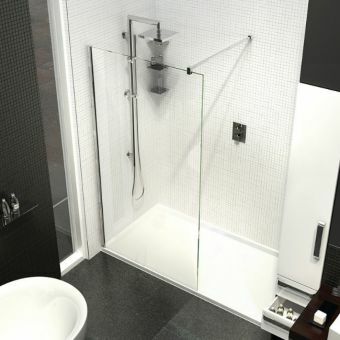 Beautifully rendered enclosures and panels in bold, sheer glass or subtle curves bring the shower space to life. 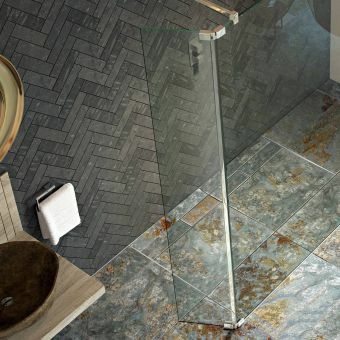 By creating frameless and semi frameless units with a minimum of ornamentation, the wetroom or bathroom with a Kudos shower enclosure becomes a light, spacious and enjoyable addition to the property. 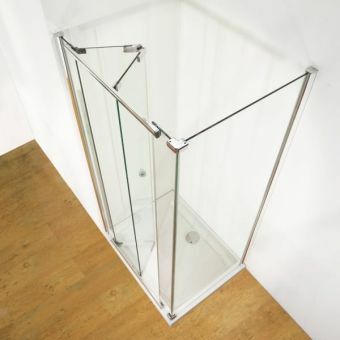 Corner shower enclosures are supplied in square, rectangular and quadrant designs, with numerous options for door mechanisms including hinged, bi-fold and sliding operations. 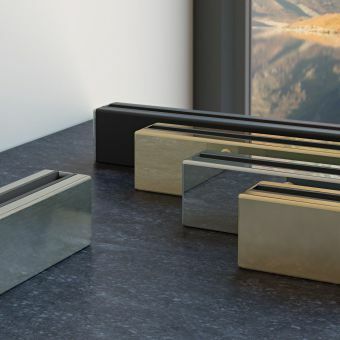 Bow fronted enclosures add a playful curvature to the interior, perfect for breaking up an interior formed of straight lines. Get up, have a shower. Go to the gym, have a shower. Come in from work, have a shower. Going to bed, have a shower. Many people use the shower at least once a day. That means investing in a quality shower that will stand the test of time, look good and suit the needs of you and your family is essential. There is little point in compromising on a product that will quickly need replacing or that doesn’t provide the type of shower that you enjoy. 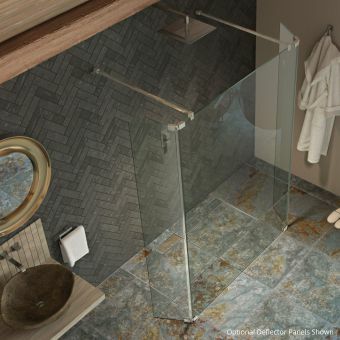 Kudos prides itself on its reputation for designing shower enclosures that are renowned for their elegance and exceptional build quality. Made in the UK, Kudos shower enclosures use the finest materials and feature removable doors for thorough but easy cleaning. 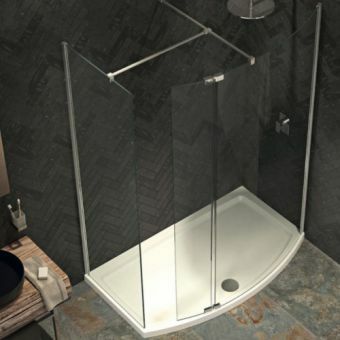 Whatever the style or size of your bathroom, Kudos has a shower enclosure to suit you, and you can be confident that the exacting standards to which they are built mean that their lifetime warranty is one you can trust. Kudos shower enclosures are the perfect product to make sure that your shower meets the expectations and demands of you and your family. No matter your budget or space - small to luxurious; your style - traditional, contemporary or minimal; or need - practical or something a bit more special, the Kudos range of shower enclosures has choices for you. The range offers flexibility too, a combination of side panels with doors can create a larger shower enclosure, allowing you to get your budding football team through en masse and in a hurry or to indulge yourself in a spacious shower enclosure, perhaps with multiple shower heads, for a bit of peaceful you-time. It might be that you are adding an en suite to escape sharing with the rest of the family and the range also allows for the innovative use of a smaller space to create a perfect shower without compromising on quality or style. 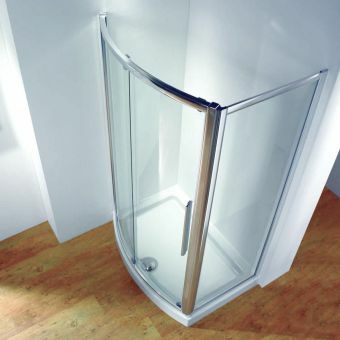 In short, Kudos shower enclosures can cater for whatever suits your personal taste, budget and space. Bathrooms come in all shapes and sizes, and then there is your home decor to take into account as well. 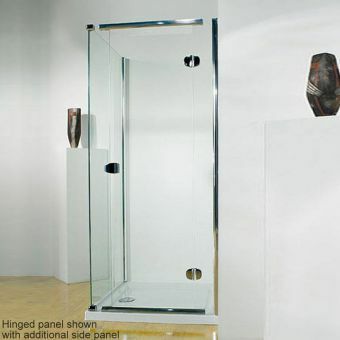 Our impressive range of Kudos shower enclosures allows you to express yourself within the space available. 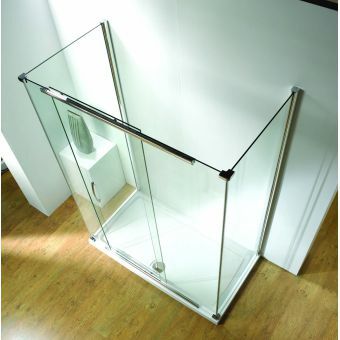 There are three collections of shower enclosure from which to choose along with a range of complementary door options. Here is our ultimate buying guide. This range is brand new for 2017. 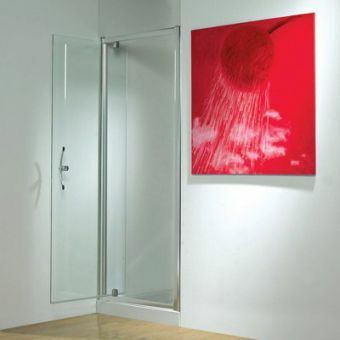 Elegant and minimalist in design, it offers two door types: the hinged or the sliding shower door. The doors are beautifully engineered to open smoothly and are made from toughened glass with Lifeshield protective coating. Pinnacle8 is perfect for smaller spaces, such as an en suite or a loft conversion, and is designed to fit into a recess or to be part of a corner enclosure. The simplicity of the design means that the Pinnacle8 shower enclosures will work with a more traditional bathroom just as easily as with a modern bathroom. Straight lines and a stylish finish with concealed fittings allow you to make this shower the centre of attention or a simple cubicle while your roll top bath takes the stage. 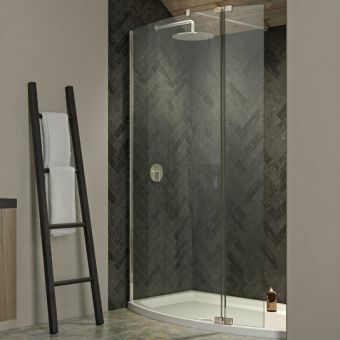 Pinnacle8 doors are available in seven different widths, meaning that if you have a large bathroom and want this look, then you can order the largest door at over 1.5 metres, while the smallest is 760mm for those tighter spaces. As the name suggests, this is the original Kudos line and still one of the best shower enclosure ranges available. The classic design is superbly engineered and offers excellent value for money. 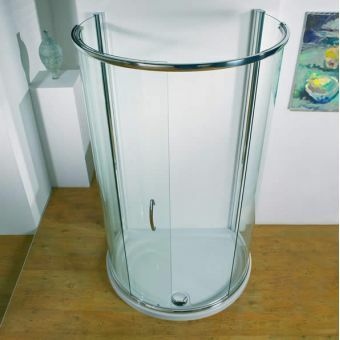 Each style is fitted with 8mm safety glass and has a number of shapes and sizes to fit your bathroom. 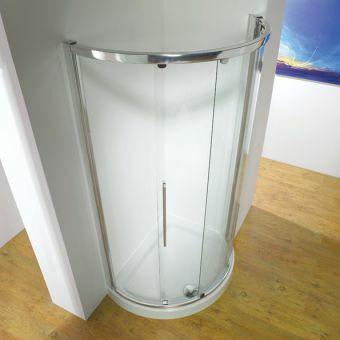 The Original range has straight, corner and curved options and doors to fit the compact bathroom, at 760mm wide for a single door, to 1700mm bi-sliding doors which can be fitted to a recessed shower or used to create a large and luxurious enclosure. 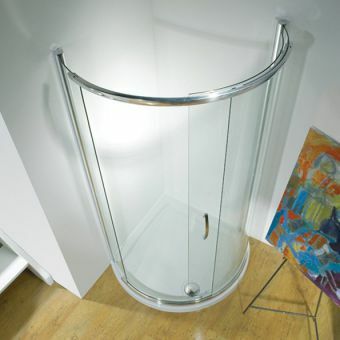 The larger enclosure showers are very popular with people seeking to replace the bath, perhaps due to changes in mobility. 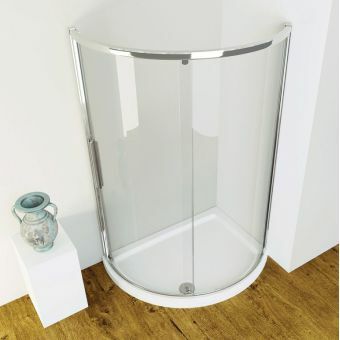 Doors available include a curved sliding door for a corner shower or an original corner slider where two small doors slide to meet at right angles, especially useful in smaller spaces although a larger option is available too. The elegant bow-fronted sliding door and an offset sliding door are also firm favourites with our customers. The range also features pivot doors, a corner slider – another design perfect for smaller spaces – and bi-fold doors. 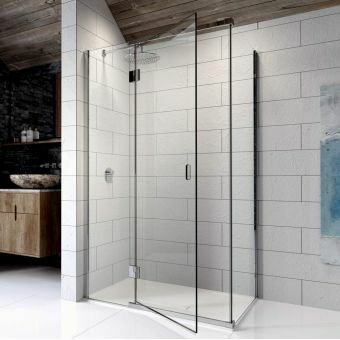 The Infinite is ideal for those looking to create the modern minimalist look with simple high-quality design features delivering a stunning shower enclosure to satisfy the aesthete in your home. Doors are available in flat, curved or corner designs, allowing for the flexible design of your bathroom, whether you are starting with a blank canvas or have interesting nooks and crannies to accommodate. For the smaller bathroom, there is the bi-fold shower door option, offering a 760mm or 1200mm slide panel for corner installation. Other door options include flat and curved sliding, bow fronted sliding and hinged. All Infinite doors feature concealed magnets for closure, which you can adjust according to your personal preference. In choosing your shower it is critical that you carefully consider the space available and doors are a large part of this. Kudos offers different types of door and there will be at least one that suits your space. Pivot doors often need the most space to open fully. 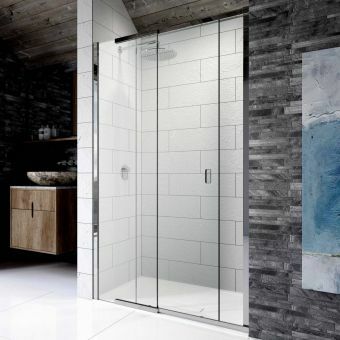 They are similar to a traditional door to a room and need to have the space to open outward from the shower. if you are thinking of choosing pivot doors, you need to measure the space between either walls or other components of your bathroom suite, such as to the sink, toilet or bath. These doors are attractive and can be flat or bowed but otherwise offer clean lines and uninterrupted glass. 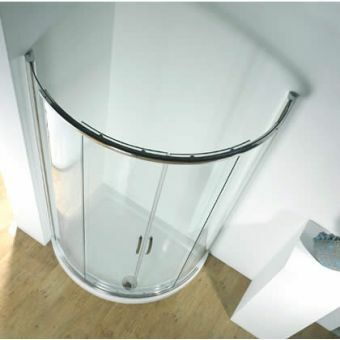 They can be fitted to a recessed shower or side panels are available for a corner configuration. Pivot doors create a watertight seal when closed and have some capacity for adjustment, particularly handy if your bathroom has uneven walls. 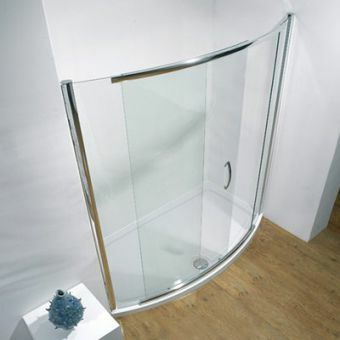 Quadrant shower enclosures can fit neatly into a corner and the Kudos range offers curved sliding doors on these. 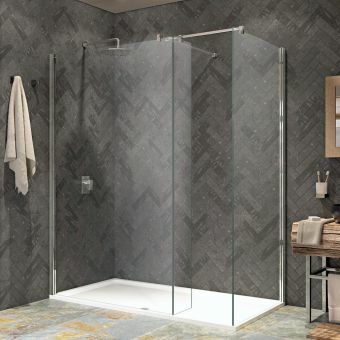 For a larger space, an offset sliding shower enclosure is attractive and gives a little more shower space, sometimes allowing a bit more flexibility over where the entrance is sited. 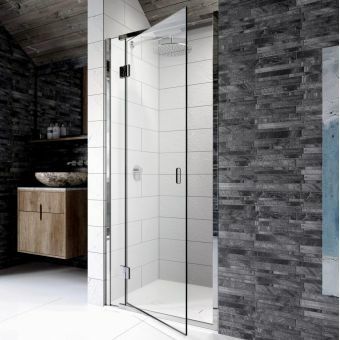 For something a little different, you can set a quadrant shower off a flat back wall, giving an almost circular shower standing out into the bathroom. Bi-fold doors and sliding doors are perfect for those bathrooms where there is less space for a door to open out. 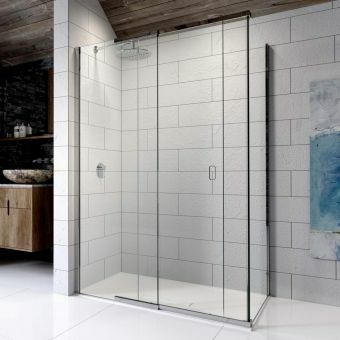 Suitable for recessed or corner showers, with side panels, the door has a fold in the middle and at the edge which allows it to open into the shower, meaning the shower needs only its footprint and no additional space to allow for the opening door. Hinged doors open outwards and can be left or right opening, depending on your space. They do need to have the room in which to open out and Kudos has a range of sizes or door and panel to help you create the space you want or need. 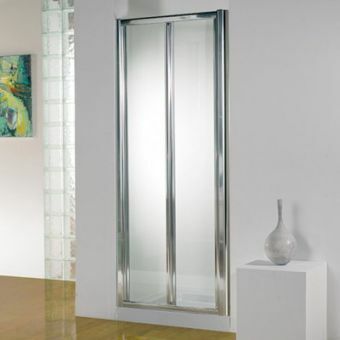 Hinged doors make for impressively minimalist showers and excellent ease of access. 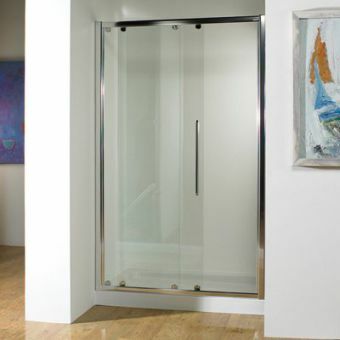 Sliding shower doors are, in many respects, similar to a patio door and give an attractive option for an area where pivot or hinge doors will not work. The doors can be used for a recessed shower or any other configuration with the necessary side panels to complete the enclosure. Whether it’s a family bathroom, the one the kids use, an adult-only bathroom or a guest bathroom, you can be confident in the lifetime guarantee that Kudos offers its customers. A good shower should be an investment but it should offer value for money and have a long life. The classic and minimalist designs from Kudos also mean that the style is timeless and unlikely to date, meaning that your new shower enclosure really can be the last one you need to fit. Kudos shower enclosures are built to exacting standards using crystal clear safety glass with Lifeshield protection. Lifeshield helps you to keep your shower looking good for longer, it’s easier to clean and the unique bond with the glass means that the surface is smooth and resistant to limescale and soap. 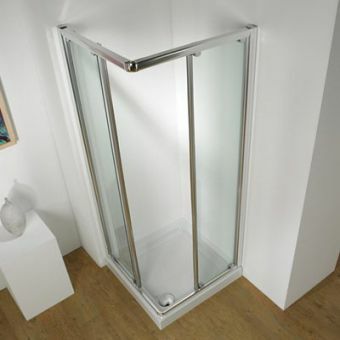 The shower enclosures are also High Performance Shower Approved, meaning that they are suitable for power showers, as well as other shower types, with a watertight bond. 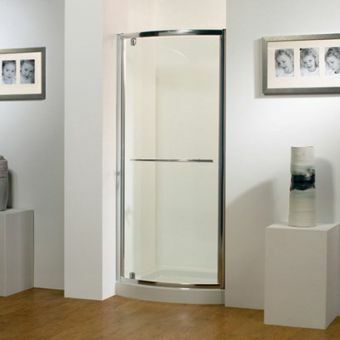 Shower enclosures and doors come complete with concealed fixtures and stainless steel roller bearings for smooth operation. Kudos works continuously to create or adopt new technologies to provide high-quality showers. In choosing your enclosure, you do need to consider the type of shower you are planning to install and whether it needs additional panels or not. You can, of course, call us at UK Bathrooms to talk through your needs and make sure that you are ordering all the components you require to install your perfect shower enclosure or complete bathroom.